Sri Lanka has a long and painful history of “disappearing persons” who are critical of the government. Sri Lanka has the second highest number of disappeared in the world. Towards the end of the war around May 2009, and onwards, a new cohort of disappeared persons emerged, namely, those who surrendered to the Sri Lankan military on the days and hours leading up to, and after, the end of active combat. Some served as members of the LTTE, some in very senior positions, and some who were compelled to join in the last months of the war. Many of those who surrendered themselves to the Sri Lankan army worked within civilian roles in the defacto LTTE controlled areas, and were not active combatants. In many cases the parents, or a spouse, or another loved one, was with the surenderee when they were last seen at the hands of the Sri Lankan military. They almost never returned home. The nine years since have be turmultuous for those who are still in search of their loved ones. Around February 20, 2017, a group of mothers, in Killinochi, Marunthankerny (Jaffna), Vavuniya, Trincomalee and Mullaithivu started roadside protests to seek answers for those who are disappeared. Their questions are fairly straightforward, yet without answers; their demands, seemingly reasonable, yet undeliverable; and their quest for justice, painful, and at times, seem unrealizable. To date, 7 of these mothers have died in the year since the protest took place. They ask us (those from the west with any links to government or NGO’s) a very simple question: What happened to our sons and daughters? I saw him get onto a military bus. I know that she survived the end of hostilities. I was with her until the last day. I did want to leave him alone but I was promised that I can see him soon, so where is he? The answer invariably lies with the government. The estimates of missing women, men and children range from 16,000 to as much as 60,000 unaccounted during the last weeks of the war. President Maithiripala Srisena acknowledged last year that there may be as much as 65,000 missing persons on the island. This has resulted in sleepless nights, with never ending searches for their loved ones. Every tad bit of information increases their hopes, only to be crushed when they appear to get close to their missing family member. These mothers have now taken to the streets to demand justice. They have set up make shift tents with pictures of their loved ones plastered on the walls and they stay day and night seeking justice. I had the opportunity to meet with those in Vavunia and Killinochi during my visit to these areas earlier last month, and have reflected on their future since I met them. On the last days of the war that ended in Mullivaikal, much damage and destruction took place. Countless lives were lost, and many homes, and villages were pillaged and destroyed. As the LTTE surrendered on May 18, 2009, many of those who either served as cadres in the LTTE, or those who worked within its territories, “surrendered”. They surrendered with the belief that their lives will be safeguarded under the international laws of war. With the case of the members who served within the LTTE, the Sri Lanka’s draconian Prevention of Terrorism Act., would offer a carte blanche opportunity for the Sri Lankan state to prosecute. Many of the cadres, and non-military operatives of the LTTE surrendered with their family members, either their spouses, or with spouses and children. When the surrender took place, those who were believed to be members of the LTTE, including young people who may have not even know what they were doing, were placed in a special line, and asked to board buses operated by, or on behalf of the Sri Lankan Military. In many instances, it was the parents, or spouses, who walked and encouraged their loved ones to go onto the buses. The vast majority of those who surrendered have been seen by third parties, and often validated with accounts of these people being seen alive when last spotted. They were last seen alive in the hands of, or in the care and control, of the Sri Lankan armed forces. Since May 2009, parents, spouses, and children searching for their loved ones were given the run around. In the first instance, some family members were extorted and misguided into giving money to army officials or unscrupulous operatives who claimed to have some links to the military. They were sent on wild goose chases to hospitals and camps and cities, only to be told, that their loved ones were not there. Concurrently, government at the time falsely stated that many of those who surrendered were released and they fled the island to places like Europe and North America. The inference was that they have abandoned their family members, including their spouses and children. These lies and misinformation continued for years. In the intervening period, those family members went to the ends of the earth to find their loved ones and demand answers. (n)	And more, including direct pleas and petitions to politicians, including the President and Prime Minister. Now the government in its attempt to adhere to UNHRC resolution 30-1, is setting up the Office of the Missing Persons (OMP). The OMP appears to have some administrative tools that will enable family members to access certain administrative benefits (i.e. Certificate of Absence to be issued will enable families to transfer title to property etc.) and some financial compensation, it is seen as yet another attempt to prolong and drag the families of the disappeared through another dead end process. If the expectation is that the OMP can investigate every complaint and find the answers to the missing person, then the mothers will be deeply disappointed. The investigative powers are limited, and its ability to prosecute even more so. If the OMP finds credible evidence, then it has to hand it over to the competent authorities to prosecute. Even then, the OMP is not expected to delve deeper into all the complaints, just some emblematic cases that may reveal some consistent patterns. While this is helpful in seeking some truth, it doesn’t go to the core of what these mothers are seeking. The handling of the issue of missing persons by the government of Sri Lanka is deeply troubling. The President, when he met with the families of the disappeared suggested that if there is any evidence that their children are alive, then he will personally drive them to the camp to find the missing persons. International dignities, and NGO’s, continue to meet with the family members, and these mothers continue to pour their hearts out. Sadly, no one is able to give them the answers they need in order to have closure. In reality, however, most of the disappeared are unlikely to be found alive. They are likely dead, but may never be found. One thing is clear - the government is squarely responsible for this. Individual commanders and those in leadership position can share in the responsibility – the government is also responsible for prolonging the misery of families of those who disappeared as it is not addressing the root cause of the missing, but diverting the issue and covering up for its military. The government of Sri Lanka, particularly, the current President, needs to come clean on this issue. First and foremost, provide a list of disappeared – a task that ought to be relatively easy given the amount of information that is in the government’s purview. This would build confidence by the family members that the government is serious about the plight of those who disappeared. Secondly, the family members need assurance that the OMP is serious, that it will function independently, and be resourced adequately. The OMP needs to move swiftly towards some initial moves that will gain the confidence of the family members. A slow start void of any substantive and swift action by the OMP will deem its work irrelevant and meaningless to the victims. Thirdly, the families need support. While many are financially struggling, their real issue is that they are unable to move forward without truth and justice. Fourth, having ratified in the UN Convention on the Protection of All Persons from Enforced Disappearances in 2016, the Sri Lankan government should honour its intnernational legal obligations to hold criminally responsible any persons involved in the disappearances leading up to, during and after the final phase of the armed conflict. The painfully inspiring work of these dedicated women who have for a year toiled the heat and dust and pain of demanding justice cannot go home empty handed. 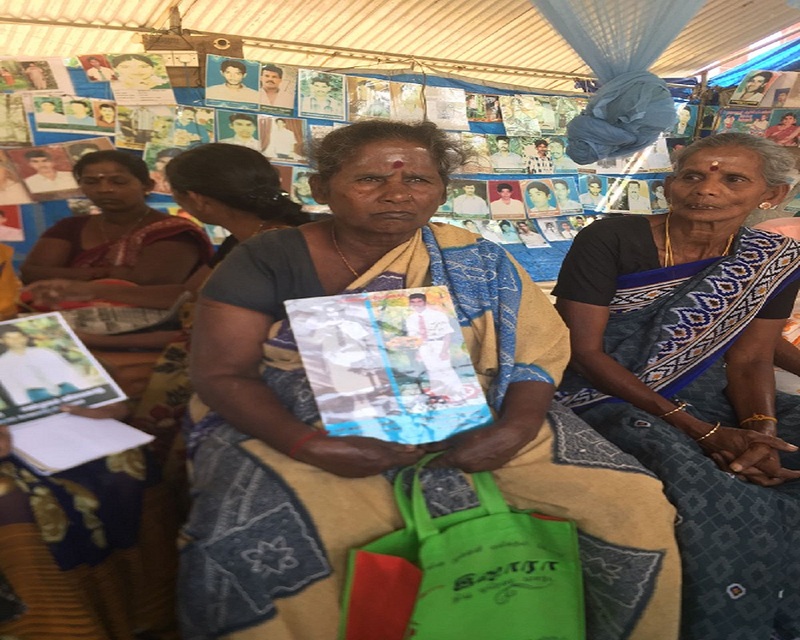 In the Killinochi district alone, there are over 1,400 ‘disappeared’ family members seeking answers about their loved ones. After frustrating every available outlet, they have now been left with no choice but to take their struggle directly to the streets. They want the international community to take part in this struggle, and until and unless they have some answers. The Srisena regime brought hope and renewed aspirations for Tamils in January 2015 with its election. This soon evaporated to a point now where the victims wonder what they have achieved. The normalization of post war, post-Rajapakse (and now pre-Rajapakse) era, has allowed the government to gain new-found allies in their attempts to allow the Sri Lanka state to continue to do what it has always done – that is to be accepted by the international community. You will have to excuse the mothers and the family members if they are not yet ready to reconcile while their loved ones are still accounted. The diaspora groups who often felt a need to reconcile in an attempt to assist the Sri Lankan state towards normalization must rethink their long-term strategy. Once normalized, the actual victims would not have any hope available to them in their search for truth and justice. That would result in a weakened Tamil community and lingering pain and suffering until they find answers – answers that may never come. I know that many who survived the end of the war are still looking for their loved ones. This is why a robust accountability mechanism is essential for peace and reconciliation. I personally remain committed to a process of accountability that will have the trust and confidence of the victims of the war and the families of the disappeared. I have learned about mothers of the disappeared, the mothers who come this February will mark a year vigilance and activism to ensure that accountability and justice for husbands, and their sons, and their daughters – they inspire me…they are a reminder that our work is not done.